The tower at All Saints church is a visible reminder of centuries of our heritage. 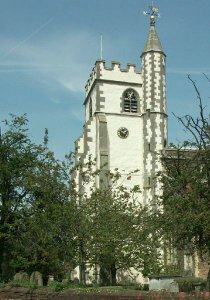 Visitors are welcome to the church, and the ringers at All Saints are proud to share their heritage of English style bellringing with the community. The tower will be open, giving members of the public a rare chance to see inside this historic bell tower. Visit to the tower roof to see one of the finest views over Wokingham and the surrounding countryside. Please note that the tour involves climbing spiral steps to the full height of the tower (about 70 feet). The Town Council has adopted a 1950s theme for Heritage Weekend in 2011. In keeping with that theme, visitors will be able to see a display about bellringing in Wokingham in the 1950s . During the afternoon the rest of the historic grade 2* listed building will be open for visitors to look round. Visitors are also welcome to look round the 7 acre churchyard, which includes many historic memorials, as well as areas devoted to the encouragement of wildlife, and some magnificent old trees. Copies of the book 'Living Heritage – 300 years of bells, ringing and bellringers at All Saints Wokingham' will be on sale during the afternoon. See more information.